We’re whipping up two kinds of bruschetta today: a traditional bruschetta and a tomato mango bruschetta! Both are so easy and make the perfect healthy snack. Combine all ingredients in a bowl. Spoon over toasted bread and serve. Preheat oven to 350 degrees F (176 C). Toss to combine cherry tomatoes, mango, and oil on a parchment paper-lined baking sheet. Roast for 8 to 10 minutes, or until tomatoes have burst. Combine roasted tomatoes and mangoes with basil, salt, and pepper. Serve over toasted bread, drizzled with balsamic reduction. 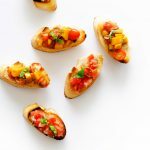 Recipe from Live Eat Learn at https://www.liveeatlearn.com/tomato-mango-bruschetta/.